Examining waste in the outdoor industry. speakers. gear repair. used gear yard sale. Waste is an issue an every industry, including the outdoor industry, and we need to learn how our entire industry can create better systems to reduce our footprint without sacrificing the outdoor experience. Grab a drink and learn how to repair your gear from the experts on hand and chat with waste experts. Free to attend and shop. $25 to sell and space is limited. Type II Fun (n.) - Fun that begins with best of intentions and is generally miserable in the moment, but totally worth it for bragging rights at the bar later or building character. Often akin to suffering, and forgetting about how much it sucked when looking back on it. Type II is a weekend of all things endurance. Through speakers, films, workshops, trainings, and socials, we'll build community across our chosen sports of passion (and pain!) and inspire future adventures. Whether a seasoned endurance athlete, or contemplating toeing the line on of your first endurance race or challenge, there is something for everyone. 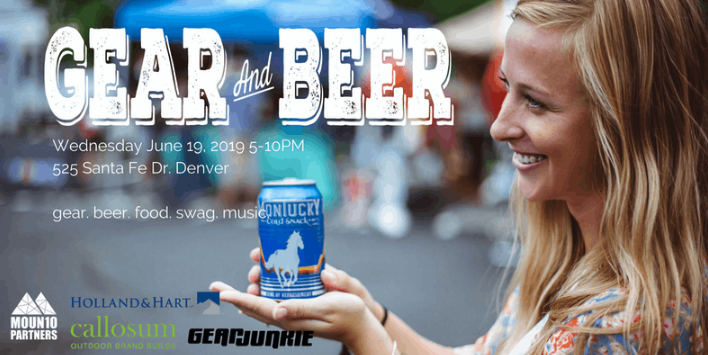 Gear & Beer is a festival celebrating the hustle and entrepreneurial spirit of independent emerging outdoor, travel, adventure, and lifestyle brands. Come shop from our vendors, grab craft beer, listen to music, and enter for chances to win some swag. The 2018 Summer Festival featured 70 companies, 25 rad brands, 5 breweries, 7 states, and attendees took home over $7000 of free gear including a Kokopelli packraft! 2019 is only going to be bigger and better!! Vendor applications open now with early bird pricing through March 31.